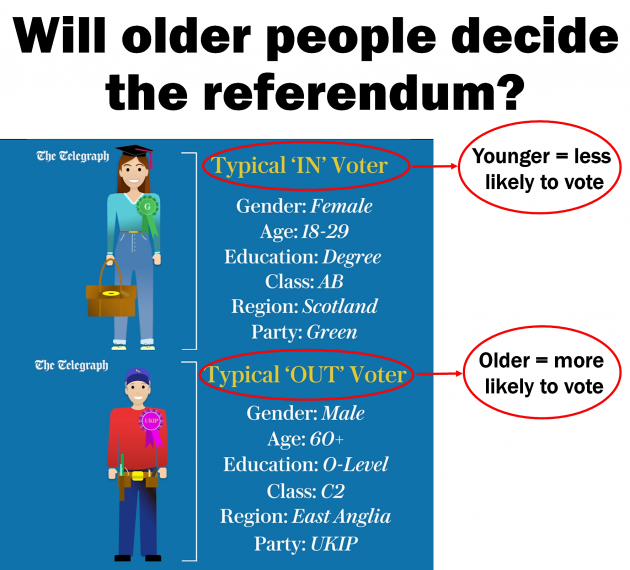 Will older people decide the EU referendum? If you’re young with a University degree and live in London, Scotland, Wales or Northern Ireland, you’re more likely to vote for Britain to remain in the EU. But if you’re older, with only a secondary education, and live in provincial England, you’re more likely to vote for Britain to leave the EU. That, in basic summary, is the result of a survey conducted by YouGov on the profiles of the referendum voters. The Telegraph has broadcast an animated video which illustrates the divide more starkly: the typical ‘Remain’ voter, according to the newspaper, is a female aged 18 to 29, with a university degree who lives in Scotland and votes Green. And the typical ‘Leave’ voter is a man aged over 60, with just ‘O’ levels who lives in East Anglia and votes UKIP. But here’s the biggest divide of all: older people are more likely to vote, and younger people are not. So, will older people end up deciding the referendum result, simply because not enough younger people who can vote, will vote? It’s a serious issue. Giving lip service to ‘Bremain’ or ‘Brexit’ isn’t enough. Without casting a vote, it doesn’t matter what you think. No vote means no say. • Most over 60s want Britain to leave the EU; they outnumber 18-24 year-olds two-to-one, and they are most likely to vote. • Most under 25s want Britain to remain in the EU, but there are just 7 million of them compared to around 14 million over 60s, and they are least likely to vote. The latest opinion polls show that voters who have made up their minds are split down the middle. In online polls, those voters who want to ‘LEAVE’ the EU and those who want to ‘REMAIN’ in the EU are, give or take, about equal at 40% with (curiously) slightly more wanting Britain to ‘REMAIN’ when polls are conducted by phone. Around a fifth of voters, however, are still unsure how they will vote in the referendum. These undecided voters may hold the key to the referendum result; together, of course, with those young voters who can vote – if only they can be persuaded to actually vote. I have stated from the outset that I will accept the democratic decision of the electorate, whichever way the referendum vote goes. But that also means I want the result to be truly representative of the majority of the electorate. Often in elections that isn’t the case. For example, in last year’s General Election, almost 65% of voters did not vote Conservative – but we still ended-up with a Conservative government. And in the previous year’s European Parliament elections, UKIP won most of the UK’s seats but with less than 10% of the electorate actually voting for them. That’s because only a third of the electorate actually bothered to vote. Low turnouts are not healthy for democracy. 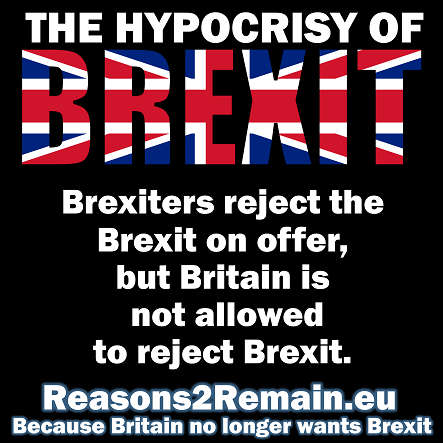 If you have a vote in the referendum, you are privileged and should use that vote without fail – whether you are voting ‘Remain’ or ‘Leave’. And I say privileged because many people who will be profoundly affected by the referendum result won’t have a vote in the referendum – such as many British migrants living in the rest of the EU, and almost all EU migrants living in Britain. Despite that and somewhat ironically, 70 non-British nationalities resident in the UK from the Commonwealth and Britain’s other ex-territories will have a vote. And although 16-to-17-year-olds had a vote in Scotland’s independence referendum, in which they actively took part, they won’t have a say in the EU referendum. Even though the referendum result will affect those young people for much longer than all other voters, and even though it was the will of our House of Lords that they should have a vote. All that seems unfair, and it is. But there is probably nothing we can do about it now – except to say to all those who do have a vote, please use it. A referendum vote is unlike any other. In a general election, if you’re say a Labour voter in a strong Conservative town, or a Conservative voter in a strong Labour town, you could say your vote is wasted. In those circumstances you almost know that whether you put your polling card into the ballot box, or let it slip out of your hand and blow away in the wind, the result will probably be the same regardless. The same cannot be said for this referendum election. In this referendum, every single vote counts – literally. 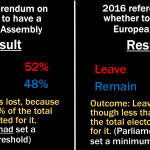 In this referendum, every vote is exactly equal to another vote – literally. Furthermore, this is likely to be the most important vote in all our lifetimes. There are just 74 days to the referendum vote, the result of which could affect the country for more than 74 years. It is incumbent upon all of us who can vote, to actually vote. Whether it’s for ‘Remain’ or ‘Leave’ it’s vital to cast your vote. And it’s needs to be one or the other; ‘Remain’ or ‘Leave’. There is no middle ground; there is no point or justification for saying ‘don’t know’ or ‘don’t care’. In 74 days, it’s decision time. When the country speaks on this, we need the reply to be loud, strong and decisive. The world is facing what is probably the most dangerous and difficult issues in the lives of most people reading this article. The world’s worst refugee emergency resulting from widespread war and violence. The threat from Islamic extremist terrorists such as ISIS. The worldwide economic crisis. The potential calamity of global climate change. Whilst our attention is preoccupied with this referendum, those huge issues are not now receiving the full attention they urgently and desperately deserve and require. So, we need to see-off this referendum. If the electorate responds with an indecisive answer, or there is a low turnout, this matter of Britain’s on-off relationship with the EU will rumble on and on. And our standing as a country will subsequently diminish. And our focus will continue to be taken off the bigger issues. If you’re a voter in the referendum, please decide how you’re going to vote, and be resolved to actually vote. If you’re not sure which way to vote, I empathise. But there are now 74 days to find out the information you need to be able to make up your mind. Please don’t leave it to the last minute. The country, Europe and the world really are waiting with bated breath on how this referendum in Britain is going to turn out. Please don’t miss this opportunity to do your bit and take part. Please vote. 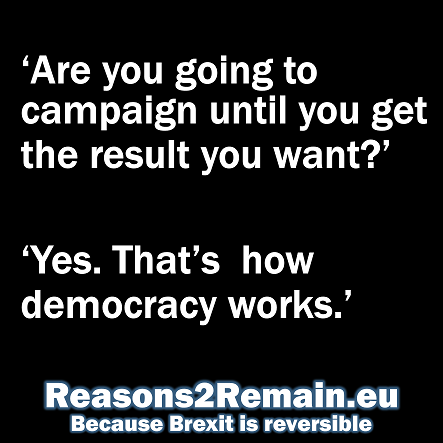 It’s either ‘Remain’ or ‘Leave’. 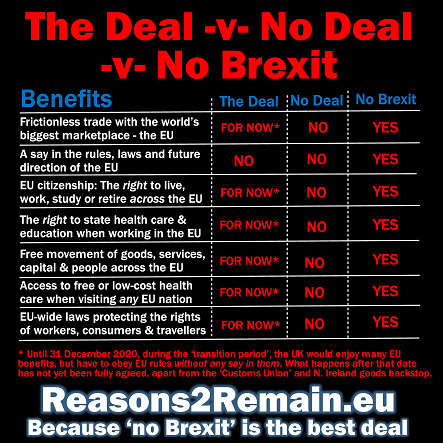 This entry was posted in Current Affairs, Democracy & Citizenship, Economics & Trade, Media & Communications, Politics & Public Policy, The EU and tagged 23 June 2016, Bremain, brexit, EU, EU referendum, European Union. Bookmark the permalink.